"We knew he had asked for one and we sent him one to him during the playoffs". Todd Chernecki CEO of SubPac is recalling the moment he found out that Cleveland Cavs' point guard Kyrie Irving was wearing the wearable subwoofer he and his long term friend and co-founder had created. "We continued to get requests to send more immediately after that and then it was literally the next day we heard the reports he was wearing it during practice and in the warm up," he said. "Then LeBron James was wearing it and then people were seeing it on ESPN. The biggest days of their lives and here they are, the whole team, wearing our product." But that's just the tip of the iceberg. The backpack-looking device that aims to deliver a full body immersive sound experience has some pretty big admirers. Android co-founder Andy Rubin is noted as a SubPac fan and heading over to the startup's website you'll see a list of artists and producers that only have good things to say about the wearable including Grammy award winning producer Timbaland, George Clinton, Fatboy Slim, B-Traits and Crissy Criss. Many have started to make it a part of their music making process. "It's being used by some of the top producers in the world as a means of understanding low end," Chernecki told us. "That in turn let's the people listening to the music experience what these producers and sound creators have spent so much time to master." The success hasn't taken Chernecki entirely by surprise though. "We knew that we hooked a whale with SubPac and it was a huge opportunity that spanned so many spaces and so many experiences and types of people," he told us. "It's still surreal as it all unfolds in real time. You see something you've created impact on people's lives. People like Timbaland, who has totally bought in to what we are doing and pushing it everyday. Having a producer as prolific as he is evangelising your product is great for us." The story of how SubPac was born goes back some time as Chernecki explained. "Me and my co-founder John Alexiou had been friends since were young kids," he told us. "Music had always been a big part of our lives and we always went out to live music whether it was concert or raves in the early 90s. It was that physical feeling of being at a live concert that was the invigorating part of going out and seeing live music. "Fast forward some years later and John purchased this chair that had a subwoofer built into it. It did a really good job of recreating that experience, but still had all the same problems that a subwoofer had. So you couldn't use it late at night because it made too much noise and it wasn't portable." It wasn't until the second version, the M2, that it truly became wearable. Finding the form factor that worked was tricky, but making that happen was just one of the challenges that Todd, Alex and his team faced. "All of the problems of the traditional subwoofer and speaker technologies were removed," Chernecki said. "We were able to do increase the fidelity where it got to the point where it was studio quality fidelity on the low end. Traditionally, low frequencies create so many problems to people in the studio. They are very difficult to manage and people spend a lot of money on treatment rooms and coming up with ways of trying to reproduce low frequencies accurately. Through the technology, we've developed, we've managed to achieve that." There was also the challenge of creating a full body experience that didn't cover the entire body but still delivered an experience that felt like it was on your entire body. "That's what a live music experience is all about," Chernecki said. "It's not a localised experience. So for us, it was about developing this technology that gave you that full body immersive experience." One thing Chernecki is clear on is that this is for consumers, contrary to what its high profile users and price tag may suggest. Before letting everyone get their hands on it though, he wanted to go to the source first. Let the creators of the sound see first hand what it was capable of to make sure it had made something people would want. "We took it around to producers that have spent their entire time in the studio trying to master the low frequencies," he explained. "It wasn't until they were able to sign off and say this is absolutely accurate that we knew that we had a high fidelity experience. Starting with the creators and then moving to the consumers was a really a big part of the strategy so we weren't viewed as a gimmick." So what happens when it was handed over to a producer to play with? "It usually starts with scepticism before someone uses it." Chernecki told us. "What's been amazing is the second people try it, the response is absolutely priceless and consistently as well. It ranges from giddiness to having their minds blown to realising the implications it could have to their work flow. It opens up this door that really connects the creators and consumers that has never been able to happen before. Chernecki talks about the "other implications of physical sound" and it's no real surprise that virtual reality is mentioned. The SubPac M2 is plug and play, which means there's no need for developers to tailor experiences and games to the hardware. "When I'm walking down the street and I hear an explosion, those sound waves hit my whole body not just my eardrums," he said. "When we recreate that in the virtual world we usually do that through headphones, which provide those sound waves only to the eardrums. We are able to help trick the brain into a different experience to give us that sense of physical immersion when the body experiences a full sound wave." It's not just the SubPac team that are coming up with unique ways to use the wearable. "People have used it to reach higher levels of mediation," explained Chernecki. "They've used it for yoga. There's a program called Yoga bass where everyone wears a SubPac. We were almost certain it would be used in silent discos and that's absolutely been the case. "We don't endorse it for medical use but people have used it for passing of kidney stones or putting babies to sleep. There's definitely some off label uses that people come up with." 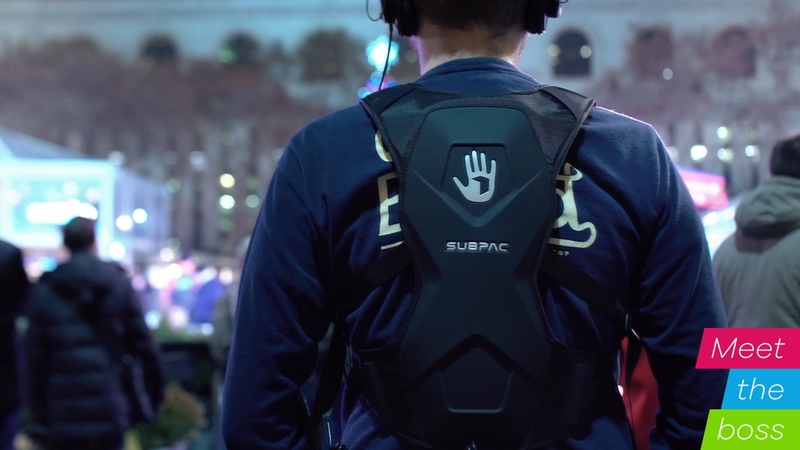 For now, SubPac is out on its own in the quest to make feeling the bass more portable. But it could soon be joined by Basslet, a subwoofer you wear on your wrist that has recently completed a successful Kickstarter campaign. Chernecki is well aware of the competition but is confident that his wearable will remain the standout option. "We're always excited about new companies coming into the space," he told us. "We're excited to see where they take it, but we view vibrating bracelets more of a gimmick in that it is a very localised sensation that it's giving. "What we do is to physically immerse the body in low frequencies and that is the key to true immersion and recreating the live experience. When we asked Chernecki to respond about claims from the creators of Basslet that SubPac was really only designed for producers and gamers, he reiterated that it is very much something for all. "When it comes to our demographic, we started our process with the creators and professionals first, but that was only to ensure we have a high fidelity experience that recreates what the content and the experience that they develop. SubPac at its core is for everyone. You will see out product adopted by consumers in every space. Not just in music, VR but across other industries. So what's next for SubPac? There's talk of moving from a piece of technology into a garment letting you wear it everyday and be integrated into your interactions every day as much as possible. Chernecki also wanted to respond to pricing, promising that it is something the startup is looking at for the next iterations. "In the next generation of products we will be releasing, the pricing points and form factors themselves will be really optimised for the consumer experience and a lot more accessible," he said. "We understand it's a high price but that's part of our strategy was we had a product that really spoke to people at the forefront of the creative experience. We are very excited about the new products that are coming around."